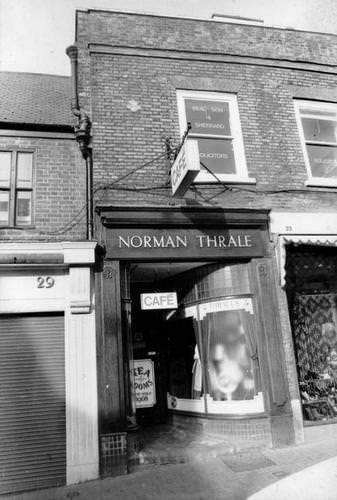 I can confirm, there was a Thrale's cafe in Market Place, St Albans. I used to work there many moons ago circa 1985/6. I think it was taken over by the Burdett brothers toward the end of its days, I'll try to have a think about dates and get back to you. I had tea here circa 1990, and just missed meeting Norman Thrale, who though very old still came in every day. I don't think he was the café type. I believe I have a picture of it and will pass it along when I find it. I just found your site while I was searching for a recipe for Cumberland Pie! 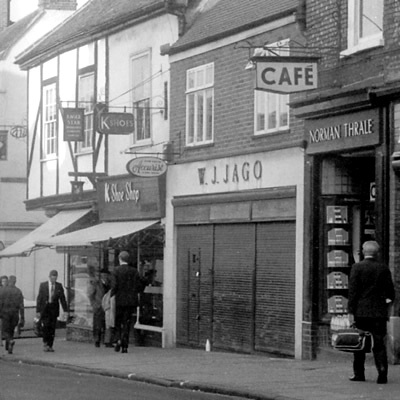 I didn't work at Waterend Barn but I did work at Thrales Cafe in the Market Place, St.Albans when I was a teenager. I worked for John and Richard Thrale, who we all called Mr John and Mr Richard. The cafe was run by an extraordinary lady called Phyllis Barnes, who had a real heart of gold, and there were a variety of staff, lots of teenage Saturday girls, like myself, and some older ladies, many of whom I believe had worked at the Waterend Barn, including a lady who taught me how to do the washing up who was known as Bill (I think because her surname was Sykes). I worked there from 1987 to 1990, but also used to visit regularly as a young child with my parents to have a currant bun and a glass of coke, always served in a glass on a turquoise/green saucer, which were still in use when I worked there! Its funny really, because I hadn't thought about it for years and I was talking about it just the other day because that is the only place I know which ever served Welsh Rarebit, and Buck Rarebit too, which I am beginning to think only myself and my Thrales colleagues (along with Mrs Beeton of course) ever know existed! I loved working there ... and even though I now live in Australia, I am a little ashamed to admit that I think a Thrales butter knife is still lurking in my mother's cutlery drawer, back in St.Albans. As I understand it, when they closed the cafe they preserved a whole booth in the local St.Albans museum. I'd love to hear whether this is part of your family ... I am sure it must be! I expect you know all of this already, but thanks for the opportunity to reminisce. Family tree for Norman & Hannah Thrale. All St Albans genealogical records.